a subsidiary unit of the spectral density of radiant flux. Used in radio astronomy, it is named in honor of K. Jansky (1905–50), an American scientist who discovered cosmic radio emission in 1932. Its abbreviation is Jy; 1 Jy = 10–26 watt per square meter per hertz. 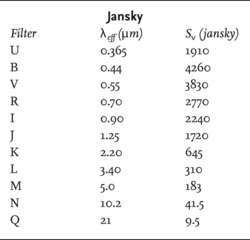 A unit of measurement of flux density, in units of watt · meter-2· hertz-1; 1 jansky is 10-26W · m-2· Hz-1. Abbreviated Jy. Bethke, Jansky, and Hamernik used a recently developed technology to show that decreasing the activity of one key enzyme--invertase--is sufficient to enable cold storage of potatoes without compromising the appearance of potato chips or the growth characteristics of the potato plants. The choice was between a government monopoly with government-owned transmitting stations supported by license fees charged for the use of receiving sets, on the one hand, or a nongovernment system supported by other means with no government license requirements for the use of receiving sets on the other," Jansky wrote. The way information is presented to the pilot has changed," said Jansky. Uno de los enfoques que ha ganado popularidad entre los estudiosos de los sistemas de montana presta atencion particular a los conceptos de vulnerabilidad y riesgo (Renaud y Jansky 2008). Jansky L, Ives JD, Furuyashiki L, Watanabe T (2002) Global mountain research for sustainable development. said Jansky, who chairs Rivier's crisis management committee. Camera (color, DV), Jay Hickman, Eric Curtis, Chris Knoblock; editor, Patrick Johnson; music, Gerard Talbot; sound, Jon Greasley; visual f/x supervisor, Danny Ortega; animation, Ortega, Andrea Orellano Jansky. In 1931 a second viewing tunnel was discovered when a radio engineer named Karl Jansky used his homemade aerial to pinpoint the position of some background "static. La radioastronomia se inicio en los anos 30, cuando el ingeniero estadunidense Karl Jansky capto por primera vez ondas radioelectricas procedentes del espacio. In 1931, Karl Jansky was an engineer for the Bell Telephone Laboratory and was studying the causes of radio interference in long-distance communication using the short-wave band. Ratio waves from outer space had been detected by Jansky (see 1932), but nothing had been done about it because the devices necessary for detecting and analyzing the radiation were not yet in existence.